Did you know that one ton of recycled paper saves 17 trees and 3.06 cubic yards of landfill space? By having a paper drive, your group has the chance not only to raise money for your projects and events, but you also have the chance to save the environment! The newspapers you recycle will be used to manufacture premium-quality, conservation-minded products, like insulation and hydroseeding mulch. You could participate in a national effort to recycle materials that would otherwise be buried in our nation's growing landfills. 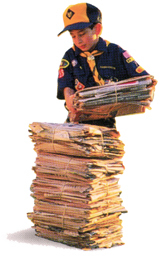 Boy Scouts of America Troop 33 of Flint, MI, has always collected newspapers to sell as a fund raising venture. One year, this troop of handicapped members and the volunteers who help them earned enough money to take a busload of their scouts, helpers and volunteers to Nashville, TN. Additionally they state, "We are very fortunate to be able to do this. All the scouts and committee are receiving a new sweatshirt, t-shirt and full scout uniforms from our recycling funds. Many of the guys are in foster care homes, so this is a great and wonderful experience for them and a well-earned (experience) for all the workers who earned the money." To see what Applegate does for each fundraiser, click to see The Applegate Difference. 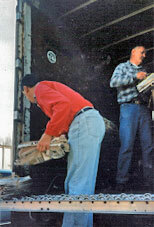 For expert advice on holding successful paper-drives, click Fundraiser Tips and Hints.